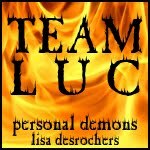 Lisa D. Writes: EPIC 666 FOLLOWERS PERSONAL DEMONS/HALLOWEEN GIVE-AWAY!!!!! EPIC 666 FOLLOWERS PERSONAL DEMONS/HALLOWEEN GIVE-AWAY!!!!! First, let me say that you guys totally rock! We’ve (still the royal we) hit 666 fabulous followers here on the blog, so Luc says it's time for an EPIC Personal Demons/Halloween give away! There will be one winner for every 30 entrants. (One entry per person, please.) The contest will run today through midnight (PST) on October 31. To enter, comment below. You must be a follower to win. Thanks to Shanyn for the buttons! Oh! You guys want to know what’s up for grabs? So, spread the word! The more entries, the more winners! Good luck! Also, don't forget that today is the last day to enter to win a signed copy of Melissa de la Cruz's Keys to the Repository and a signed copy of Personal Demons in my final Smart Chicks give-away! I'm a follower here on the blog and on twitter (@ineedsafe). Enter me only if the giveaway is international! Hi! I'm entering the giveaway from Italy, hope it's okay! I'd love to win the wonderful prize! By the way, will your books be translated? I read it in English, but I'm sure you'll find many fans here! But I don't have a blog, so I can't add the buttoms which are great! count me in please if this is international. I'm a gfc follower. Hi I would LOVE to enter this ! Thanks for the awesome contest, Lisa! I hope this is International lol.I follow you via GFC. Thank you for the giveaway!!! I'm a follower (naturally) and I've tweeted about the contest (http://twitter.com/lynseynewton/status/27461694109). And I've had Team Luc on my blog for a LONG time now. TEAM LUC ALL THE WAY BABY!!!! Hello, thank you for this giveaway. Thanks for this awsome giveaway! I'm also a follower via GFC. Congratulations on 666--that is awesome and now totally surpassed! You're up to 673 followers now! Congrats! Woo-hoo! What an awesome prize package! Congrats on the 666 followers. Thanks for the giveaway. What a great idea! Congrats on the followers! aweosme give away congrats on 666! Great giveaway!! Count me in! I wants to win sooooo bad! Thanks for the opportunity! Cool Giveaway, Thanks!...666 followers AWESOME! I'm from Australia and LOVED your book, I even reviewed it on my blog and wrote an essay on it for school! Lisa, this is so, so cool. I just finished reading it yesterday and OMG..loved it!! A completely epic giveaway! So excited! More power to your blog Lisa!! Follow you at Twitter. My Twitter name is @cherrymischivus. I thought I better stick with the angel, a little safer that way :) .... Go Team Gabe!!! Great contest! +1 I'm a follower!!! woot congrats on your followers! :D and of course, I'm one of them, woot! Oh my God! Another one of your awesome contests! Count me in if this is open internationally! +3 Hmm...Since I haven't read Personal Demons yet...I'll have to choose Team Gabe! :D Angels haven't failed me yet. Thanks for the great contest! Congrats for getting 666 followers! This is so awesome!!! Please enter me!! Hey, we just wanted to let you know that in addition to previously adding your button on our blog, we just joined twitter so that we could follow you there as well! we are def. looking forward to your next novel! What a great contest! Amazing!! +3 Posted a Team Gabe button. Oooooohhhhh ! Yay ! Thankies for the awesome giveaway ! +3 Added TEAM GABE ! Great giveaway thank you so much and Congrats on the followers! I'm crazy about your book! Thank you for the opportunity. Is it international? I'm from Brazil. OMG! I just finished it this weekend! Freaking love it! I'm still swooning over Luc! Thanks for this totally awesome giveaway! WOOHOO! This is just epic! I'm a GFC follower and a Twitter follower (both under mizzlizzbeck). Hope I win! Just signed up in GFC - YAY!!! Please count me in, & *fangs-alot* ! AWESOME! Thank you for this great giveaway! Couldn't possibly miss it, so if it's international, count me in! Congrats on the book, the blog and all awesome giveaways! Ha, that is hilarious about the tattoos! If international, please enter me. I am a follower. I've been wanting to read Personal Demons for ages, but my library hasn't got it. I finally got aroudn to downloading CH. 15.5. Hopefully I'll get a chance to read it before Nano. If it's internationally, I'm in!! Follower of twitter (@rodox93) and of the blog (Rodolfo). Wow -- great contest!! Thank you!! Thanks so much for the amazing contest!! Yay! Awesome!! Thanks for the chance. That's such a cute T-shirt! I really want to read your book! +1 Tweeted but can't work out how to get the link. This is how I roll... Another contest! Frannie got to party with Evie and Jacinda!